Silsila (The Affair, 1981) and Lamhe (Moments, 1991) are Yash Chopra films about thwarted love. Both were box-office failures when first released--the first for seeming to condone adultery, and the second for its incestuous undertones. While I didn't have moral objections to either film (although the thought of a middle-aged Viren being romanced by an 18-year-old Pooja in Lamhe is a bit creepy), I find their classic status to be somewhat puzzling. In Silsila, the writer Amit (Amitabh Bachchan) has just met and fallen in love with Chandni (Rekha); his brother Shankar (Shashi Kapoor), a fighter pilot, has been betrothed to Shobha (Jaya Bhaduri Bachchan) for some time. Knowing little about the film, I still realized immediately that Shankar was doomed, and sure enough, fifteen minutes into the film he's killed in action. When Amit learns that Shobha is pregnant, he decides to save her honor and that of his brother's child by marrying her, and writes a bitter letter to Chandni telling her to forget him--but without telling her why (shades of Devdas). Amit later meets Chandni again; in one of several unlikely coincidences in this film, she's become the wife of Dr. Anand (Sanjeev Kumar), who saves Shobha's life (but who can't save the baby) after a car accident. Amit and Chandni begin an ill-concealed affair--especially ill-concealed when they all but declare it to their appalled spouses during a Holi celebration. There's a particularly heart-breaking scene where Dr. Anand pleads with his wife for a loving embrace as a sign of her affection; her reluctance tells him all he needs to know. Out of his love for Chandni, though, Dr. Anand goes on a business trip whose thinly disguised purpose is to give her the opportunity to run off with Amit; in one of the most emotionally telling scenes in the film, at the airport Dr. Anand gives Chandni a last look full of sadness before boarding the plane. Shobha, too, realizes what's going on, and discovers that she has grown to love Amit (although, given his coldness towards her throughout the movie, you have to wonder why). And there's a confrontation scene between Shobha and Chandni whose emotional impact is heightened if you believe the rumors that Amitabh Bachchan and Rekha had an affair in real life. But there are yet more incredible coincidences, a totally ludicrous climax (I'll just say it involves a plane crash and the highly improbable rescue of a single passenger, while everyone else on the plane dies) and what feels like a tacked-on resolution. The film works neither as a latter-day Krishna-Radha fantasy (Amit and Chandni's behavior towards their kind and loving spouses is too self-involved and cruel for that) nor as a tawdry slice of realism (those coincidences, and the plane-crash of an ending). I find that I'm not the only skeptic about Silsila; you can read a kindred (but funnier) review at The Post-Punk Cinema Club. Seeing this from his perspective, we're to be forgiven if we conclude (as he does) that she returns his feelings. Watching a second time, you can also see what's less apparent on a first viewing (and which is entirely invisible to Viren): Pallavi's wistfulness as she thinks of her absent lover, Siddarth (Deepak Malhotra). When Siddarth returns and marries Pallavi, the brokenhearted Viren returns to England. After the couple are killed in an accident, though, Viren has their daughter Pooja raised by his amah (the great Waheeda Rehman) at his estate. Viren only visits briefly each year on the anniversary of Pallavi's death. Eighteen years later, Pooja (Sridevi in a double role) is a young woman, and she's fallen in love with this remote, emotionally withholding father-figure (c'mon--that never happens in real life!). Viren, though, is highly disturbed by her resemblence to Pallavi. And for some odd reason he thinks that his role as her surrogate father and the 25-year difference in their ages present problems--I can't think why. (Of course, in real life Anil Kapoor was only a few years older than Sridevi.) But despite Viren's repeated rebuffs and his sudden determination to marry his long-suffering Westernized girlfriend Anita, Pooja is undeterred. Yes, it's the classic battle between the woman who is the symbol of the West vs. the woman who is the symbol of India--I wonder who wins? Since the film involves a double helping of Sridevi, your feelings about it will probably depend on whether you find her irresistibly charming or highly annoying. This is my first Sridevi film, and I have to confess that she won me over as thoroughly as she does Viren. Sridevi's irrepressiblility and the terrific dance numbers (including one in which songs from earlier Bollywood movies are parodied), the striking landscape of Rajasthan and the beautiful Rajasthani costumes (particularly the adornment of the women), make up in part for a film that spins its wheels for most of the second half and whose happy ending may leave you instead feeling somewhat queasy. Update 23 October 2012: On Sunday, October 21, Yash Chopra passed away in a Mumbai hospital. Our thoughts are with his family at this sad and difficult time. Update 12 November 2012: In memory of this legendary figure, I've written a post on Six favorite songs from Yash Chopra films. Update 30 July 2014: In late 2012 Sridevi appeared in the delightful English Vinglish, which I later picked as one of my favorite films of 2013. Update 25 February 2018: Sadly, Sridevi passed away late last night. I've written a brief appreciation with links to several posts about her films. As I got to your final words - "feeling somewhat queasy" - I found myself thinking that I really don't want to see either of these. I'm sure I'll get to Silsila at some point if just for Shashi, but it sounds ridiculous and mawkish with few redeeming features ('cause I can definitely take ridiculous and mawkish when they're packaged in ways I like). It's also got that huuuuuge self-sacrifice thing, which rarely sits well with me. As for Lamhe, from the way you describe it, it seems awfully hard to root for Pooja - she seems so delusional. Beth, as the PPCC points out, Shashi's character is in Silsila just long enough to impregnate Shobha, take a shower with Amit (! ), and get shot down. He's very appealing, but you know he's doomed from the start. And yeah, I found the film to be unsatisfactory all around--though opinion was split in our household on this one. If, like some, you find Amitabh to be a smoldering hunk of irresistible manhood, you might be more sympathetic to his and Chandni's dilemma. The big question that Lamhe never quite answers is exactly why Pooja remains so fixated on someone who's not only old enough to be her father, he is her father--er, guardian. (And technically unrelated to her, we must emphasize). Curiously, Lamhe was written by a woman, Honey Irani, which doesn't make Pooja's fixation any more convincing. Lamhe is worth seeing, though, for the musical numbers. One thing that we noticed as we watched the film is that it seemed as though both Juhi Chawla and Madhuri Dixit modelled parts of their screen personas on Sridevi--ironic, since soon after Lamhe they came to eclipse her. Heehee. We'll see if those 15 minutes are enough to sustain me. I have a goal to see all of the Shashi-Amitabh pairings so I can figure out what made them so popular together (and to think about my own fondness for them together as well), so I'll get to it eventually. I do not find Amitabh to be any such hunk, especially in brooding poet mode. Blech. That's a big question to leave unanswered. I'm trying to think of other father-figure fixation stories; there must be some. I had to go look up what else Honey Irani has done - an interesting list. That's very interesting re: Sridevi; I doubt I've seen enough of Juhi or Madhuri to notice that, and I'm glad you brought it up. Beth, I'll be really interested to see your post on the chemistry between Amitabh and Shashi. Some star pairings have it--Katherine Hepburn and Spencer Tracy, Cary Grant and almost anyone, Robert Redford and Paul Newman--and many don't. (One reason we like SRK so much in this household is that he seems to have great chemistry with all of his female co-stars, with the possible exception of Aishwarya). I'd like to think that when two stars have terrific onscreen chemistry it's because they like each other in real life; on the other hand, it's not really acting, is it, if you're pretending to like someone you actually like. Honey Irani has done some really interesting films--Kya Kehna (1997/2001) in particular is a fascinating and frustrating mix (it's a feminist anti-abortion film, if you can imagine such a thing)--and some others that seem more generic. In Lamhe, Sridevi is by far the most appealing and lively character, but at the same time she embodies a male fantasy (of course, attractive 18-year-old women relentlessly pursue middle-aged men who were in love with their mothers). I'd like to think that in at least some of her films Honey Irani is trying to offer a woman's critical perspective on male-dominated society; at the same time, she's a commercial screenwriter who ultimately has to make her stories conform to standard formulas. As usual, Memsaab, your Bollywood erudition is staggering. I think you're referring to Chirag Kahan Roshni Kahan (1959), in which Honey plays Raju, the son of Ratna (Meena Kumari). "A pregnant Ratna loses her husband, eventually gives birth to a son, Raju, in a hospital where she is treated by renowned Dr. Anand. Four years later, Anand re-enters their lives and starts becoming a frequent visitor. This does not auger well with Ratna's mother-in-law and Bela, her husband's sister, who make her life miserable, eventually forcing Anand to stop visiting. Shortly thereafter Anand gets married to a nurse, Maya Verma. Maya is a spendthrift,does not get along with Anand, and eventually finds out that she cannot conceive. When Anand's dad passes away, he leaves considerable wealth to Anand's child, including a monthly allowance of Rs.10,000/-. Maya initially plots with an advocate, S. Prakash, who is Bela's husband, who had assisted her in getting married to Anand, to try and prove that her late father-in-law was insane, and when that fails she and her aunt, Nurse Sarla Verma, concoct a plot that Ratna's son is really Anand's biological son, leading to their lawyer filing a custodial case in Court. The question remains is Raju really Anand's son, will Ratna readily give away her child, and is Maya capable of bringing him up?" After years of watching Yash Chopra movies I have come to the conclusion that all his movies have one fatal flaw or the other. In Silsila its the fact that everytime Shobha gets pregnant Amit drops poor Chandni like a hot-cake! In Lamhe its really hard to believe anybody would spend a solitary life (I think this was implied about Viren's life, inspite of the girl friend) because of a blighted teenage affair! As to other father-figure infatuation stories - I remember a Rajesh Khanna-Smita Patil starrer Anokha Rishta where a young girl (Sabia) falls for her guardian (Rajesh Khanna). Old British and Hollywood movies have a lot of these Daddy-Long-Legs type of stories, though. Maybe Honey Irani was trying to Indianise Daddy-Long-Legs? I think Honey played a little boy in a few films. Her sister Daisy did too; in fact, Daisy was a little boy in a LOT of films in the 50's/60's. Bollyviewer, thanks for your comment! Re: Silsila, it's just another example of how in Bollywood, motherhood trumps everything else, including narrative logic. I've not seen Anokha Rishta, and somehow was unaware of Daddy-Long-Legs--thanks for the links. I think you're right: reading the summaries, it sounds like there are definite plot similarities. Sita-ji, I watch some movies in order to be able to wallow in feelings and behaviors that I wouldn't want to go near in real life. I'm not sure I'd call that hypocrisy; we let actors portray our worst impulses, and then let them suffer the consequences (if any) more as a kind of catharsis. Only, neither of these films really works as a guilty pleasure, at least for me. While they both have entertaining moments, too many eyebrow-raising questions go unanswered, and their resolutions are too abrupt and unsatisfactory. Thanks for your comment, and for the introduction to the Bollywood Food Club! 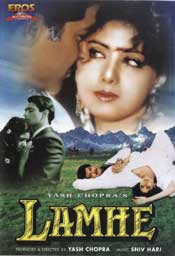 Haha m I the only one who liked Lamhe?!? I watched that movie a couple of years after it was released and I must hv been 7 or 8 then, but I remember being enamored by it, the opulent and beautiful people, gorgeous scenery, convertibles :)!! And also for the intellectually superior feeling it induced in me, maybe for the first time in my life, since, hehe, it was "flop", and isn't it the epitome of being intelligent when u like a flop movie?? (I only discovered much later that the tag applies to art films and not to commercial cinema, atleast not so much!). But coming back to the point, I luuuurrrrved the movie, and promptly fell in love with Sridevi and maybe becoz of that childhood infatuation can still relate to the characters and understand their fascinations. But where Silsila is concerned, except for the unconventional color scheme (beige, off-whites, sedate, no- Diwali every day kind) I did not at all like the movie, it grated on my nerves, i found some of the scenes so idiotic and the characters of Rekha and Amit failed to evoke any sympathy from me (I think Anil was just such a S-A-D thing in Lamhe that u had to kiss his boo-boo). And in the end I just wanted them to run away together coz they didn't deserve their respective spouses. 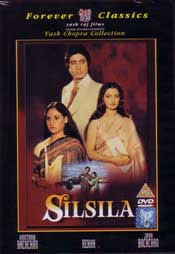 (note: I watched Silsila for the first time a week back, and I am all grown up, rational and mature :P). BTW Rekha looked like a dream, and yes now I am in love with her (Bollywood actresses are just so much more beautiful than their male counterparts!). Karishma, Lamhe is gorgeous to look at, particularly the Rajasthan scenes, and like you I found Sridevi to be irresistible (although I discover that, as with an appreciation of Rekha, not everyone shares that feeling). And I'm in total agreement with you about the goddess-like beauty of Bollywood actresses. My Bollywood viewing partner, though, tells me that in her view Shah Rukh Khan, Akshaye Khanna, and Amitabh Bachchan possess superabundant attractiveness of the masculine kind. I haven't seen 'Silsila' yet but I am definitely with you on Sridevi being the one thing that prevents 'Lamhe' from being just another Bollywood romance with an icky storyline. I hated it when the daughter fell for him - I just found it very disturbing. So I didn't like the story at all (and for another thing, who could possibly even like the hero? Anil's character is such a loser!) but I couldn't help but be charmed by her performance (like you, it was my first Sridevi movie). Ironically, I have a friend who says 'Lamhe' was the movie that turned her off Sridevi. Daddy's Girl, opinion seems to be divided on Sridevi, but I'm definitely in the camp of the fans. So far, we've seen Judaai (1997), Lamhe (1991), Chandni (1989), Mr. India (1987), and 15 minutes of Sadma (1983). All are seriously flawed, but Sridevi's performances and dancing have been the best things about them by far.